Lewis Hamilton has taken another decisive win at the Japanese Grand Prix, fending off Max Verstappen in the final few laps. Daniel Ricciardo completed the podium for Red Bull Racing. The win is a major one for Hamilton, as his championship lead is now further extended after Vettel retired early on with power issues. As the lights went out, Lewis Hamilton made a solid start to maintain his leading position, from pole into the lead of the race. Sebastian Vettel slotted into second, but by the end of the lap was passed by Verstappen for second position. Esteban Ocon on the other hand managed to shuffle ahead of Ricciardo to take fourth . Moments later, Vettel reported a loss of power on the exit of Turn 9, which on the pit straight cost him three positions at once. Sainz meanwhile lost control in the Esses and ended up in the gravel trap, drawing a safety car on track moments later to allow marshals to safely remove his car. 2 laps later, the race was back on. Vettel however reported the issue with his power delivery continued. One lap later, he was told to pit and retire the car, as it seemed like nothing could be fixed via steering wheel switches. The other Ferrari of Raikkonen also didn't enjoy the best of race starts, as the Finn got a bit too opportunistic on his first pass through Spoon curve, ending up on the run-off area and artificial grass, dropping down to 10th. On lap 8, Marcus Ericcson went straight on into the barriers at Degner 2, ending his race early as well. The move is unlikely to impress his team, a worrying prospect for the Swede who admitted he still had to convince Sauber to allow him to continue into 2018. A virtual safety car the result. The slow period triggered McLaren to do a pitstop for Stoffel Vandoorne. The Belgian, who started from 9th, went slightly wide over the kerbs on the exit of Turn 2 at the start of the race and ended up just behind Alonso, who by then moved up into 16th position. The stop on lap 10 dropped Vandoorne from 15th to 16th, losing just a single position to Lance Stroll. At the end of the VSC, Ricciardo enjoyed a great slipstream behind Ocon and managed to get past him on lap 12. Another lap later, Bottas did the same thing, demoting Ocon from 3rd to 5th in just two laps time. By lap 20, Hamilton led by 5 seconds on Verstappen with Ricciardo third, 3 further second further behind. Bottas was trailing 4 second down in 4th while Raikkonen had progressed into 5th, having enjoyed a number of overtakes on Hulkenberg, Massa and Perez. Verstappen became the first of the front runners to pit on lap 21, changing supersofts to new softs. Red Bull completed a quick stop and allowed Verstappen to emerge marginally ahead of Kimi Raikkonen. Hamilton pitted another lap later, and started another phase in the race. Bottas was left in the lead, but when Hamilton complained about his car's balance and of Verstappen coming back on his tail, Bottas made way to allow Hamilton past while taking position in between his team mate and the charging Red Bull driver. The move did wonders for Hamilton, as his pace ended up being a full second per lap faster than Bottas, allowing him to build a 3s advantage before Bottas pited on lap 30. Daniel Ricciardo on the other hand didn't appear a threat anymore, as just like in Malaysia, his later pitstop made him lose considerable time. His 3s deficit on his team mate turned into a 10 second gap. After that, the action happened in the midfield, as positions at the front became stable. Hulkenberg notably encountered another frustrating retirement. Having driven a solid race and pitting fairly late to change softs for supersofts, the German returned to the track behind a group of cars, including Massa, Magnussen, Grosjean and Gasly. After Gasly had a pit due to a flat spotted right front tyre, Hulkenberg returned to the pits with a DRS flap stuck open. Renault had no option but to retire the car. On lap 46, Stroll also retired after his front right tyre suddenly collapsed while in a quick left hander of the Esses complex. Stroll controlled the car through the gravel and subsequently parked in the grass, introducing a few laps of VSC. When the race was on again, just three laps remained, but the action fired up intensely. Verstappen suddenly emerged right behind Hamilton due to Massa and Alonso who were fighting for position themselves. Bottas meanwhile put the heat on whereas Bottas put the heat on Ricciardo for third place. Massa and Alonso were so occupied with each other in a battle for the final point that the held up the leaders, with Alonso also allowing Hamilton past seperately from Verstappen, despite the two being just 0.7s apart from one another. The Spaniard would later also receive a 5s time penalty for ignoring blue flags. 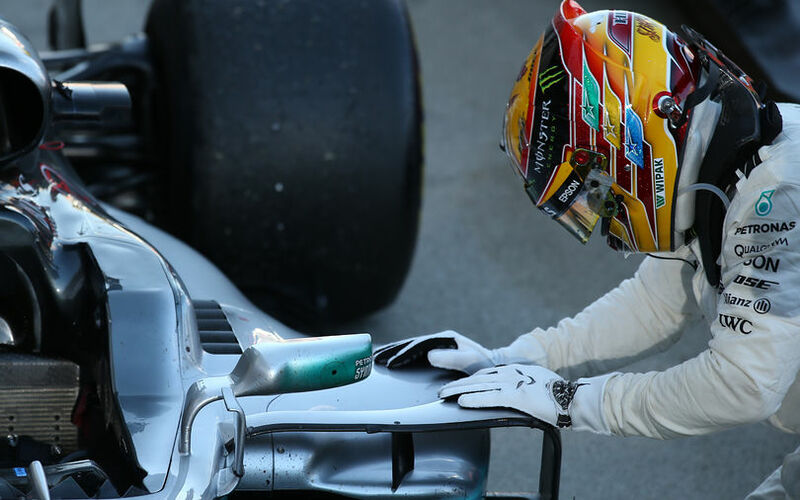 Even without that shuffle late in the race, Hamilton essentially had the best possible weekends, extending his championship lead by 25 points to make it a nearly certain Wold Championship title for him, unless reliability issues intervene for him as well.